Professor Stephen Hawking was an extraordinary man who turned his weaknesses into his strengths. He actually became a world-famous scientist thanks to the disease he was living with for over 50 years. The moment of very realization of the disease was crucial for Stephen’s life, as he became much more engaged with studying and science afterward. This man is highly worth admiring, as he achieved something most regular people only dream of. Stephen is so inspirational that we simply couldn’t resist writing an article about this man. What is more, we will present a list of 77 things you probably didn’t know about Stephen Hawking that might teach you a life lesson. At the age of 21, doctors diagnosed Stephen with a condition which affects the nerves and muscles and causes their shutting down. This condition is called amyotrophic lateral sclerosis or Lou Gehrig’s disease. Stephen noticed some issues earlier, as he had felt weakness in his knees and fell a couple of times. One more prognostic was related to his indistinct speech so it was hard to understand him sometimes. However, Hawking was ignoring the signs on the road and refused to see a doctor, until his father decided not to accept no as an answer. Doctors then undertook a series of tests and diagnosed the early stage of ALS, giving home only 2 to 3 years to live. After the initial phase of despair, Stephen realized there is actually nothing to be scared of. He had many plans and dreams and firmly decided that he was not going to give up life. However, using a wheelchair, dealing with slurred speech, losing his voice afterward, and tracheostomy didn’t manage to break Stephen’s spirit and his desire to live and create. Despite all the conditions he fought, Stephen still could be able to use his fingers, move his head, and run his eyes. During that time he used a speaking program from one of California computer programmers, which helped him a lot with his work. Eventually, Stephen lost all of his body control but directed the program with a cheek muscle sensor that helped him write some of the most world famous scientific papers, as well as non-scientific ones. 1. Stephen Hawking was born in 1942, on January 8th, which is actually the exact date of the 300th anniversary of Galileo’s death. 2. His full name was Stephen William Hawking. 3. When he was at the age of 9 Stephen’s school grades were nearly the worst ones in the classes. 4. He learned to read just when he turned 8, while his sister was reading at the age of four. 5. Still, he seemed like a brilliant child even then. This is the reason why his teachers and his classmates gave him a nickname “Einstein”. 6. He built a mathematician computer with his classmates at the age of 13. 7. Despite his average grades, Stephen did the physics exam almost perfectly and got to Oxford. 8. Stephen considered biology is too inexact and descriptive, while he liked well-defined and precise concepts more, such as mathematics. As Oxford didn’t have mathematics as a major, Stephen chose physics as his major. 9. Still, Stephen considered Oxford boring and signed in to Cambridge to study cosmology. 10. He spent only an hour daily focusing on his work and studying but still graduated with honors. 11. Both of his parents attained Oxford and had successful carriers. 12. Stephen grew up in a bit uncommon family. They usually read books during supper, never had a car, and kept bees in the basement. 13. He used to lie on the grass with his mother and look at the stars. 14. During his first year at college, Stephen faced loneliness and depression, which made him think about joining the rowing team. As his first symptoms appeared much earlier, Stephen never had an athletic build. Still, a position of a coxswain was just perfect for him. A coxswain doesn’t row, but controls strokes and steering. 15. This all actually made Stephen popular among his fellows and he appeared as a truly adventurous type. 16. Just one week before Stephen was diagnosed with ALS, he had met his future wife – Jane Wilde. 17. He used to say that engagement with Jane was one of the main reasons that gave him the strength to fight against the disease. 18. Another reason was the one that, when Stephen realized, he was going to die young, he wanted to do as many things as possible while he is still alive. This was accompanied by his long period of productivity. 19. Stephen shared a room with a guy who was diagnosed with leukemia. Seeing this young man in such condition made Hawking double think his situation. 20. He used to say that you should look up for the stars, not down to your feet. 21. Hawking believed that being angry about your disability is a time waster. You won’t get anywhere if you are constantly complaining or being angry. 22. Stephen and his fellow, Jim Hartle, created the theory about the boundless universe in 1983. The theory itself is a combination of the concepts of quantum mechanics and Einstein’s theories about general relativity. 23. Hawking became a member of the Royal Society in 1974. In 1975, Pope Paul VI awarded him with Gold Medal for Science. 24. In the 1980s, British Empire proclaimed Stephen Hawking a Commander of the Empire, which is a rank right next to being a knight. 25. Stephen became 17th Lucasian Professor of Mathematics at Cambridge. Sir Isaac Newton was one of his predecessors at the post. 26. Still, he was studying mathematics parallel with being a professor, as he left school at the age of 17. 27. Barak Obama awarded Stephen with the Presidential Medal of Freedom in 2009. 28. Stephen was a children’s book author too and he published “George’s Secrets Key to the Universe” with his daughter Lucy signed as the second author. The second book came out in 2009. 29. “A Brief History of Time” was sold in more than 40 million copies worldwide. 30. His work consists of over 20 books. Some of the most famous ones are “A Brief History of Time”, “The Grand Design”, “The universe in a Nutshell”, “The Theory of Everything”. 31. However, Stephen Hawking never won the Nobel Prize, despite his influential body of work. 32. Hawking tried to write his works so that regular people can understand his concepts easily. 33. He believed that there is a primitive alien life somewhere out there and even intelligent life. Stephen also stated that humans shouldn’t be afraid of contact with aliens, as we would probably find a way to become resistant to diseases. 34. Zero Gravity gave Stephen the ride of his life, as he got the chance to get out of his wheelchair and experience floating. This was the first time Stephen was freed of his wheelchair after almost four decades. 35. He used a wheelchair model Permobil C350 with a hand clicker mechanism, which helped him speak by choosing the words from the screen. 36. Even though only one of his cheek muscles was working, he was using it to communicate with the device. 37. Stephen was British but used an American accent. 38. He was double thinking about switching to a French accent but gave it up because he thought his wife would divorce him. 39. His wheelchair was able to move as fast as 8mph. 40. Prince Charles annoyed Stephen so much he ran over Prince’s toes with his wheelchair. 41. One of Stephen’s regrets was that he didn’t do the same with Margaret Thatcher. 42. However, as his electric wheelchair was so fast, Stephen was unintentionally running over his students’ toes all the time. 43. Pope John Paul and Stephen had a slight argument about Hawking’s lecture at the beginning of the universe. 44. During his tracheostomy operation, Stephen lost his ability to speak, but this helped him with his breathing issues. 45. 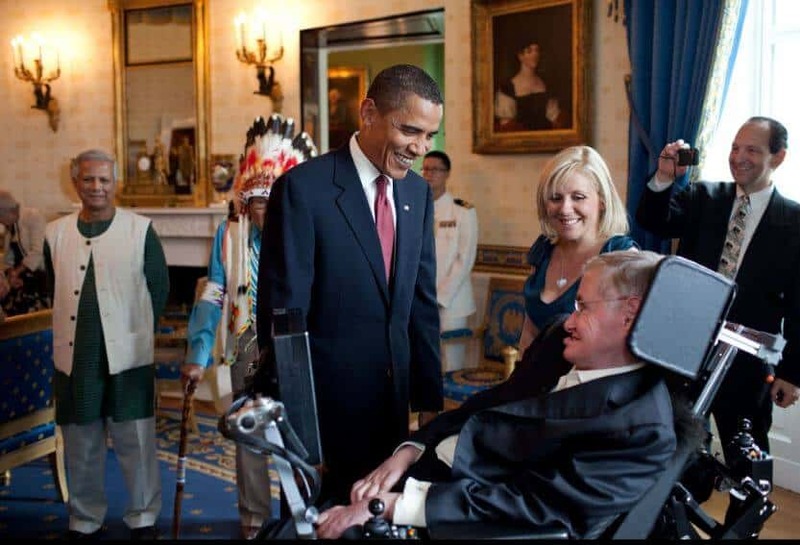 Hawking was both physically and mentally disabled person. 46. His physical condition only got worse with the years, resulting in a situation where he needed 24-hour nursing care. 47. Stephen left his first wife Jane in 1990 and married his nurse, Elaine, in 1995. 48. 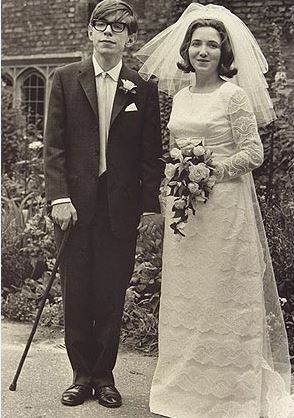 Elaine was a former wife of a man who designed Stephen’s speech synthesizer – David Mason. 49. He had two sons – Robert and Timothy and one daughter – Lucy from his first marriage. 50. Timothy used to play pranks with Stephen and his wheelchair when he was a child and used it like a go-kart. 51. After a divorce with his second wife in 2006, Stephen reconciled with Jane and their children. 52. In 1997, he lost a bet to John Perskill about the black holes, but it took him 7 years to admit a defeat. 53. Stephen had the same IQ as Einstein, which was recorded as 160. 54. Both of them are known for their equation theories. 55. His most famous theories are about black holes, the universe, and stars. 56. Hawking appeared as a guest star on Star Trek, The Simpsons, The Big Bang Theory, and Futurama. 57. Stephen was portrayed in the movie “The Theory of Everything” and in a BBC television movie. 58. When he was asked about the biggest mystery on the planet, Stephen answered – women. 59. He even accepted the ice-bucket challenge in 2014. 60. The same year he declared openly he was an atheist. 61. He threw a party for time travelers in 2009 in order to prove there is no such thing as traveling through time. 62. Stephen loved placing bets, even though he lost most of them. 63. The most precious resource according to Hawking is – time. 64. He managed to overcome his problems and his disease in order to solve problems about the universe. 65. Stephen was able to communicate only two words in a minute so it took him days to write a speech. 66. He ate regular food, just as other people do, and enjoyed eating Persian food. 67. When he was 20, Stephen traveled to Iran and liked the country a lot, even though he broke his rib during a bus ride. 68. He signed a document about banning the AI weapon system. 69. Even though doctors gave Stephen a life expectancy of 2 to 3 years, which would mean he would die at the age of 23, he lived for 76 years. 70. ALS is fatal in 90% of the cases after three years, while Stephen lived for more than 50 years with it. 71. He believed his active mind and sense for humor kept him alive. 72. People knew him as a sarcastic person. Some of them disliked this side of his personality. 73. When Cambridge published Stephen’s doctoral thesis on their site, the server crashed. 74. Stephen Hawking died on the 30th anniversary of the Pi day, on March 18th, 2018. 75. His latest work was published only two weeks before his death. 76. The key to becoming the man Stephen Hawking was in the fact that he didn’t his disability is his inability at the same time. 77. His ashes lie next to two of the greatest scientists in history – Sir Isaac Newton and Sir Charles Darwin. Stephen Hawking was a truly brave and amazing human being. He gave all the world an important lesson – that we should celebrate life and take the most out of it. Let’s take a minute and admire everything this man did despite the serious disease he had been dealing with. No disease is easy, to be clear, but losing all of your motor skills but still achieving great things is definitely something worth attention and great respect. If you are in a wheelchair, suffer from Multiple sclerosis, Cerebral palsy, autism, lost your hearing, have Down syndrome, Dyslexia, or dealing from any other type of disease or disability, you still can do whatever you want and achieve your dreams. First and foremost – don’t give up, love life, have faith, and remember that nothing can stop you! This man’s persistence, brilliant mind, humor, and courage inspired disabled people across the world, as well those who are not dealing with a disease but are coming through a rough period. Stephen’s work and art will live through many generations to come. Living with a disease doesn’t stop you from becoming the best version of yourself. If you focus on what is important to you and accept the gift you have, many great things are about to come. 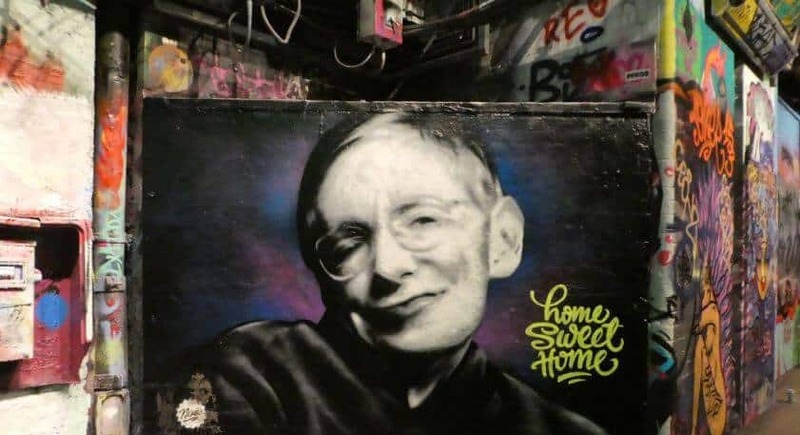 We hope that our article and 77 things you didn’t know about Stephen Hawking made you re-think your life and circumstances you are in, as only the sky is limit if we look at things for a brighter side and learn to accept but also improve.